Rheumatoid arthritis is an autoimmune disorder, in which your body’s immune system, which normally protects your body from infections, attacks the joints in your body. This causes inflammation, leading to swelling and pain in the joints and surrounding tissues. It can affect joints of the hands, knees, feet, wrist and elbows. Rheumatoid arthritis is a chronic condition and there is currently no cure for rheumatoid arthritis. However, there are various ways to obtain relief in pain to continue leading a normal lifestyle. Both hot and cold therapy is recommended for rheumatoid arthritis. Hot therapy works by dilating the blood vessels and improving blood circulation to the affected area, which reduces muscle spasms. You can use heat pads, heat lamps, warm wash cloth or warm bath to apply heat to the affected area. Cold treatment reduces swelling by constricting blood vessels and it can reduce deep pain. It is advised that you try the treatment that works best for you and continue using it. Probiotics are good bacteria in your gut that have a role to play in good digestion and they also prevent bad bacteria from invading your system. Probiotics have found to decrease inflammation in rheumatoid arthritis. They also influence the way in which your drugs are metabolized. Research in animal models show that bacteria present in yoghurt Lactobacillus casei and Lactobacillus acidophilus were more effective against inflammation from rheumatoid arthritis than the NSAID indomethacin. So a daily dose of probiotic may be effective for rheumatoid arthritis pain relief. Essential oils are obtained from plants and they have antioxidant, antibacterial and anti-inflammatory properties. The components of essential oils are absorbed by the skin and produce effective anti-inflammatory effects at the site of arthritis pain. Essential oils obtained from ginger, orange, frankincense, myrrh and black cumin seeds have been found to be effective in treating arthritis. Consult your doctor before starting to use essential oils. They can cause allergic reactions. Do a patch test before using them on the affected area. When you purchase essential oils make sure you get the pure form of the oil. It’s recommended that people suffering from rheumatoid arthritis should eat a well balanced diet. There are certain foods that can have an anti-inflammatory effect. Cold water fish especially mackerel, salmon and tuna have anti-inflammatory effects. The omega-3 fatty acids present in fish oil possess anti-inflammatory properties. The fibers present in fruits, vegetables and whole grains reduce C-reactive protein levels (CRP), which are indicators of inflammation. Including plenty of fruits, vegetables and whole grains may help ease the symptoms of arthritis. Including extra-virgin olive oil in your diet is also effective for improving your arthritis symptoms. Oleocanthal present in extra-virgin olive oil inhibits the enzyme responsible for inflammation. Being overweight or obese while having rheumatoid arthritis can place extra strain on your joints. It is highly recommended that you maintain your ideal weight to reduce the severity of the disease. However, dieting can be difficult if you have been given corticosteroids for managing your pain, as it increases your appetite. The pain in your joints can discourage you from exercising. Hence, it is recommended that you perform mild exercises such as walking, riding a stationary bike, etc. You should also do strength training to strengthen your muscles. You can also try swimming in a warm water pool which will relieve the pain and stiffness in your joints and strengthen your muscles. Opt for low calorie diet and avoid alcohol. You can also talk to your doctor about substitutes for your medications that are causing weight gain. Performing mild exercises help in rheumatoid arthritis pain relief. Moderate pressure massage is recommended for rheumatoid arthritis. It has a temporary relief from the stiffness and pain in the joints. 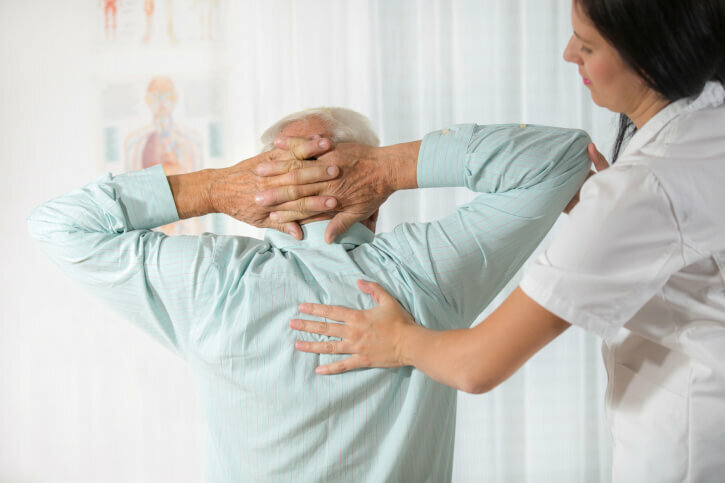 A kind of massage therapy called myofascial release, which targets the tight myofascial tissues (tissues that surround and support your muscles) is effective in relieving rheumatoid arthritis pain. Swedish massage, hot stone massage and deep tissue massage have been found to be effective in rheumatoid arthritis. Oral steroids are commonly used medication in rheumatoid arthritis that can increase your risk of developing vitamin D deficiency. Vitamin D is essential for strong bones and it also has an anti-inflammatory effect on your body. To increase your vitamin D levels it is advised that you stay in the sun for 10-15 minutes every alternate day. To increase your vitamin D levels you should consume foods rich in vitamin D like eggs, cheese, beef liver and fish like mackerel and salmon. You can also consume milk and breakfast cereals fortified with vitamin D.
People suffering from rheumatoid arthritis should regularly check their vitamin D levels. You doctor may also recommend vitamin D supplements to raise your vitamin D levels. Apart from vitamin D, vitamin E which has antioxidant properties has been found to reduce damage to the joints and thereby relieve pain and swelling. Nuts, seeds, green leafy vegetables are rich in vitamin E. Your doctor can also recommend supplements. If you had been given methotrexate as a medication for treating your rheumatoid arthritis, you should take folic acid supplements as methotrexate reduces folic acid levels in your body. Vitamins D and E supplements help in rheumatoid arthritis pain relief. Even if you are managing your rheumatoid arthritis well and feeling good relief from your symptoms you should continue to regularly visit your doctor. It is necessary that your improvements are constantly monitored by lab tests and x-rays. You should also talk to your doctor about side effects that you are experiencing. He might give you alternate medications. When you have a flareup of your joint pain it is good to rest. But too much rest may make your joints stiff and worsen your pain and fatigue. Do gentle exercises that don’t strain your joints severely. After your pain subsides you can increase your activities and do some aerobic exercises and strength training. You can also consult a physical or occupational therapist for recommendations on exercises that you can do. Patients skip medications due to cost, side effects or because their symptoms have improved. In rheumatoid arthritis, it is important that you regularly consume your medications even if you feel good. There is a danger of your pain getting severe if you stop your medications as the blood levels of your medications will decrease. Talk to your doctor for an alternate medication if you have side effects or if the cost of medications is high for you to handle. A chronic and painful disease like rheumatoid arthritis can cause low moods. If you cannot handle your low moods on your own and if your depression is interfering with your daily activities talk to your doctor about it. You doctor will recommend a psychiatrist who can treat your depression. Certain foods are not recommended for patients suffering from rheumatoid arthritis. Avoid red meat, sugar, refined flour, gluten containing foods, fried foods, processed foods and alcohol.